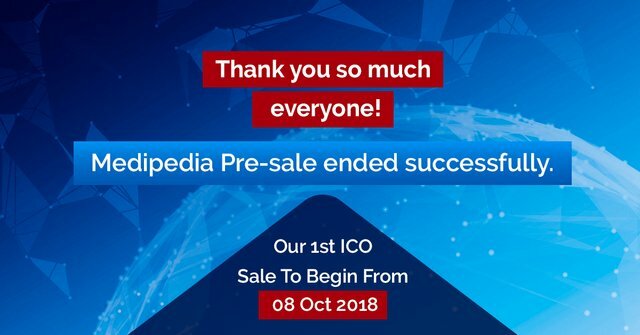 The pre-ICO sale of Medipedia, which was held in August and September this year, has concluded with a huge success. The company has officially ended the sale. The ICO (public sale) of MEP tokens will begin next month. Those, who have missed the opportunity to invest in the pre-sale, can now participate in the public sale. The Medipedia team had organised a pre-sale for earlier investors of the project. The pre-sale of MEP tokens was held from 20th August 2018 and concluded on 16 Sep 2018. The sale was quite successful. The project reached the funding target with time remaining. Now, the Medipedia project is in the after-sale phase, where the team is working on evaluating the sale results and funds generated. The more data about the sale will be revealed soon through the social media accounts of the projects. What we know is that the pre-sale was quite successful. Both the investors and the team of Medipedia are happy with the sale results. The team is now preparing for the ICO event which will be held in October 2018. Medipedia is inviting all its investors and potential buyers to participate in the public ICO sale which will start from 08 October 2018. The price of MEP token for the 1st ICO sale is USD $0.01 per token. Users will get an additional bonus of 10% on all token purchases made during the ICO sale. That means if you purchase MEP tokens worth $100 during the sale, you’ll get free tokens worth $10. The minimum personal cap for token purchase in the 1st ICO sale is 0.2 ETH or equivalent, while a single buyer can purchase maximum tokens of $250,000 or equivalent. KYC registration is mandatory for all ICO participants of the Medipedia ICO. The first phase ICO will finish in one month, following which the second phase ICO will start from 12th of November. Medipedia is a healthcare startup founded by a team of entrepreneurs based in Singapore with the aim to rebuild the medical tourism ecosystem to focus more on the welfare of patients rather than the institution. The present medical system is too institution-oriented where the entire power is in the hands of medical institutes. Patients are therefore unable to get the right information about the best treatment and care at the right time. The current system is too cloudy and misguiding where patients have to go through agents in order to even get access/appointment with a good doctor. Medipedia aims to replace the current system with a new one that is more consumer oriented. The Medipedia ecosystem is developed on the blockchain technology which effectively decentralizes all the information of medical institutions, doctors and patients’ data so that it can be freely and timely accessed by anyone in need. This will not only help medical consumers find the right and reliable medical care at the right time but also it will enable doctors to provide the best treatment to a patient based on their past medical records. Interested yet? Visit the Medipedia website to know more about the project. The ICO sale will begin soon.